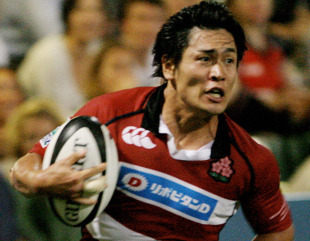 Japan winger Daisuke Ohata has been forced to retire due to a knee injury. The 35-year-old holds the world record for Test tries after crossing 69 times in 58 Tests between 1996 and 2006, controversially eclipsing Wallaby legend David Campese's mark of 64. He was forced from the field after 45 minutes as Kobe Kobelco Steelers routed Toyota Shokki Shuttles in a Top League encounter on Sunday. Ohata had been set to draw a line under his career, which took in two Rugby World Cups in 1999 and 2003, at the end of the season, but has now been forced to hang up his boots prematurely. "It's sad that it ended like this but I think I have had a good career," he told AP. "I feel I have left my mark as a rugby player."